At the end of a recent community meeting on the state transportation system, a grandmotherly woman with a lyrical Caribbean accent strode up to the top transportation official in Massachusetts, dispensing with pleasantries. She meant the bus route between Ruggles and Mattapan, which she boarded just after 5 p.m. at Roxbury Community College, to reach the meeting 4½ miles away at Mattapan’s branch library. “It took an hour and 15 minutes to get here,” she said, narrowing her eyes. Davey apologized, promising to look into it. But even when the 28 runs on schedule, it covers that stretch in 40 minutes, averaging less than 7 miles an hour — a halting trip of red lights and one-by-one boardings. That daily reality is at the heart of a set of statistics released last week highlighting a racial disparity that planners, activists, and officials considered at once shocking but not surprising. Among Greater Boston workers, white commuters who drive have the shortest trips to work — averaging less than 27 minutes each way — and black bus riders the longest, exceeding 46 minutes each way. But a gap exists even among those who take the same mode, with shorter commutes for white workers whether they drive or ride mass transit. The biggest gap is by bus. 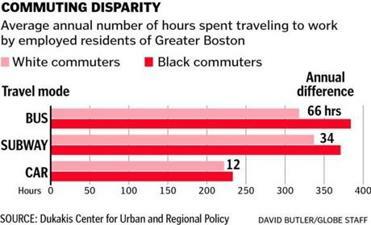 Black commuters spend an extra 66 hours a year waiting, riding, and transferring than white bus riders, according to a new analysis from Northeastern University’s Dukakis Center for Urban and Regional Policy . In other words, affordable housing is scarce and often far from desirable subway and rail stations. Those who can afford to drive largely do so, because it is faster. And a transit system built up over a century to funnel commuters toward downtown Boston does a poorer job connecting to the service and physical-labor jobs not concentrated downtown — meaning longer, slower bus rides, often with transfers. Lawmakers and advocates see an opportunity in the new year, with Beacon Hill expected to debate new taxes to support the Massachusetts Bay Transportation Authority, the highway system, and the regional bus agencies beyond Greater Boston, a transportation network deeply indebted and unable to keep up with basic maintenance and operations. But balancing the transportation budgets should not be the only measure of success, said Pollack, which is why the Dukakis Center is calculating statistics to define and track goals such as environmental sustainability and social equity. Davey said the new analysis underscores what he heard while serving as MBTA general manager and now as transportation secretary. The commuting times, calculated from data collected between 2005 and 2009 through the US Census’s American Community Survey, mean black workers spend an average of 80 more minutes a week than their white counterparts navigating the bus system. With lawmakers poised to debate transportation finance, the report “pushes us to think more broadly about what it is we want and need to do about our transportation infrastructure, not just how do we plug this hole,” she said. Historic investment created a system of haves and have-nots. One of the poorest and most densely populated stretches of Boston lies in a void between the Orange and Red subway lines, where about 126,000 people — mostly in Dorchester and Roxbury — live more than a half-mile from the nearest rapid-transit station. On the other side of the T map, the immigrant-rich city of Chelsea is similarly bus-dependent, marooned between the Blue and Orange lines, despite being more densely populated and closer to downtown Boston than several Boston neighborhoods. Transportation agencies that receive federal funding are required to consider equity, but their models do not fully capture reality, said Penn Loh, who helped create the T Riders Union to advocate for lower-income and transit-dependent riders in 2000. “We were claiming that there were significant disparities between communities by race, by income, and we certainly had a lot of anecdotes to back that up in terms of both daily experiences of people on different modes as well as historical experiences of where investment happened,” said Loh, then a community organizer and now a Tufts University professor. But state planners were better equipped to calculate whether a bus route stuck to its schedule than whether that route adequately served the public, Loh said. Boston is not alone in confronting transit inequity. Conventional wisdom says a long commute is a life choice, a trade-off for a picket-fence home in the suburbs. But research by New York City’s Pratt Center for Community Development found more than 750,000 workers living within the city limits commuted an hour or more each way, a burden shouldered disproportionately by lower-income people of color. Among New York City dwellers, black people spent 22 minutes more per day commuting than whites. “The degree to which that was segregated was shocking even to us,” said Joan Byron, the Pratt Center’s policy director. Constructing subway lines can cost billions of dollars and take decades. Pratt research made the case for bus rapid transit, which costs less to design and operate than subways. With bus rapid transit, buses travel in dedicated lanes, have the power to turn traffic lights green, and do not linger at stops because customers pay before boarding. In Boston, the Silver Line is sometimes portrayed as bus rapid transit but it lacks most of the defining features needed to fit that category. New York debuted its first “Select Bus Service” line in the Bronx in 2008, spurred by advocacy among local groups and coordination between the Metropolitan Transportation Authority, which runs buses and trains, and the city Department of Transportation, which controls streets, curbs, and traffic lights. “Select” routes now exist in four boroughs, with travel times cut by nearly 20 percent even as ridership has grown, according to the Pratt Center and the MTA. “The big constraint here, the reason we have, like, four Select Bus Service routes instead of 15, is agency bandwidth, not money,” Byron said, citing the political leadership and attention needed to win support for the streetscape changes that enable the buses. That was evident in Boston with the state’s aborted 2009 attempt to bring bus rapid transit to the 28 line, a project known as “28X.” Under a rushed timetable intended to capture federal stimulus money, the state failed to win support from leaders, activists, and merchants in neighborhoods wary of past promises and still smarting over the Orange Line’s 1980s rerouting. Davey, who inherited the aftermath, said the state is now working from the ground up on a pilot program to explore adding some bus rapid transit features in that corridor and in Chelsea. The state is also spending tens of millions of dollars to add stations to a commuter rail route known as the Fairmount Line that has run for years through Dorchester and Mattapan with few stops. But it lacks the money to run trains on weekends or with the frequency of subways and trolleys, undercutting the line’s usefulness. That could change if lawmakers approve sustainable funding, Davey said. Longer-term and at greater expense, planners are intrigued by self-propelled cars known as “diesel multiple units” that provide transit-style service on shorter commuter rail routes in Europe and Asia, without the lengthy locomotive-and-coach sets found here. Until then, residents in underserved neighborhoods will rely on sluggish buses. 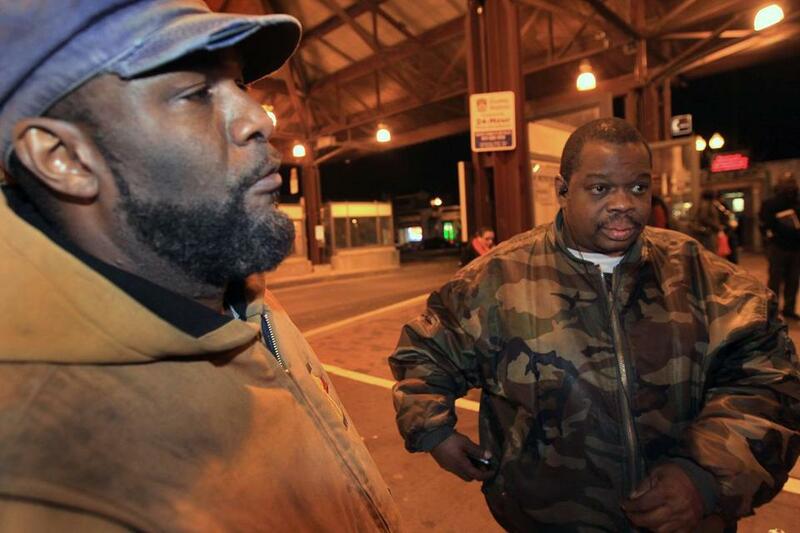 At Roxbury’s Dudley Square bus depot, commuters waiting in the cold on a recent weeknight hardly seemed surprised by the statistics. Liiban Mohamad, a 24-year-old immigrant from Somalia, said he spends an hour each way on a multibus commute between his home near Jackson Square and his restaurant-cleaning job in South Boston. Waiting for the 44 and the 45, respectively, Ron Henry and John Owens studied a graph of the commuting disparities with resignation. “It’s something that’s been around for a long time,” said Henry, a 42-year-old ironworker. He and Owens, a 42-year-old customer service representative, said crowded buses are slow buses. When school is in session, teens cluster near the front, sometimes haggling over the fare and making it harder for women with strollers to board. But some of those colleagues haul in from the suburbs. Alls’ two-bus commute from Roxbury takes a half-hour — though she lives just 2.1 miles from work.